Today, I tried out this art project with my own kids, ages 4, 7, and 9, while my 2-year-old was napping. 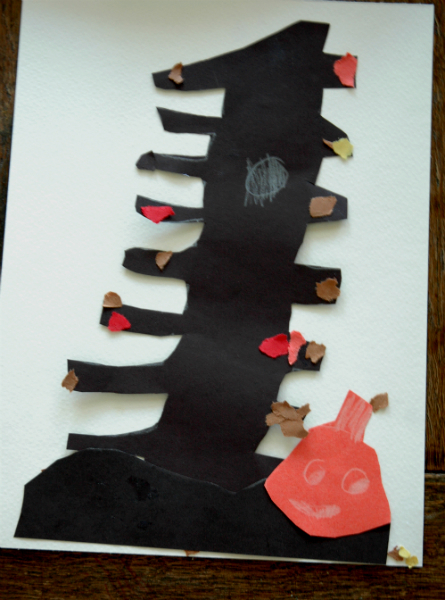 Step 1: Using white pencil or crayon, draw a tree with branches on black construction paper. My kids needed extra paper because they weren’t happy with their first try and wanted to try again. It helped when I told them that every tree is different, so it doesn’t have to look a certain way. Step 2: Cut out tree and branches. Younger children may need to cut branches and trunks of the tree separately, while older children can cut out more complicated tree branches. 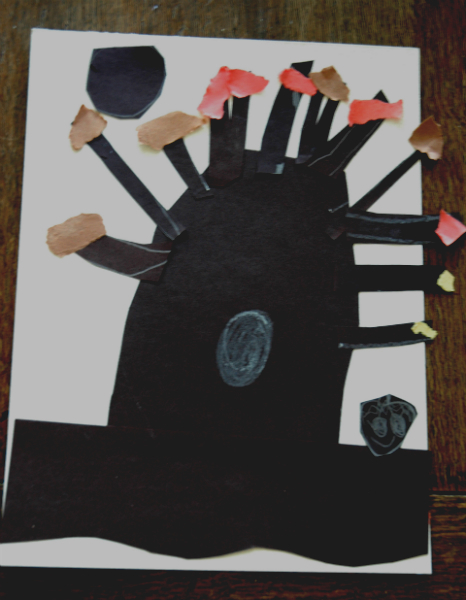 Step 3: Cut out hills or grass from the excess black construction paper. Step 4: Glue hill or grass to the bottom of the white construction paper. It is a good idea to keep the white paper vertical rather than horizontal, so the tree has more room. Step 5: Glue tree and branches to the white construction paper. Try placing it a little to the right or left to see where you like it best. 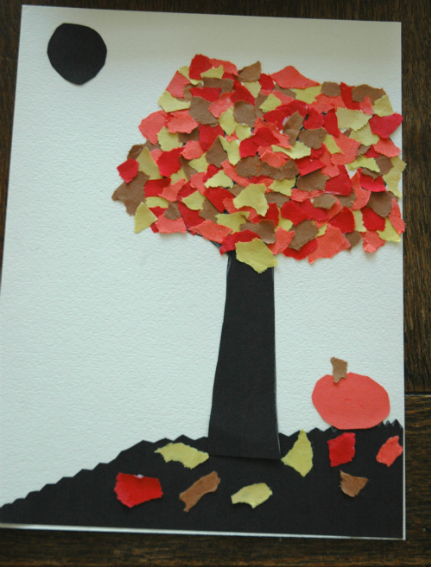 Step 6: Using the fall-colored construction paper scraps, rip out small pieces of paper that are sort of in the shape of leaves. Small pieces look nice, so rip larger pieces in half. Step 7: Glue leaves to the tree branches. Some leaves might be falling from the tree. Some might be at the foot of the tree, or in piles around the tree. 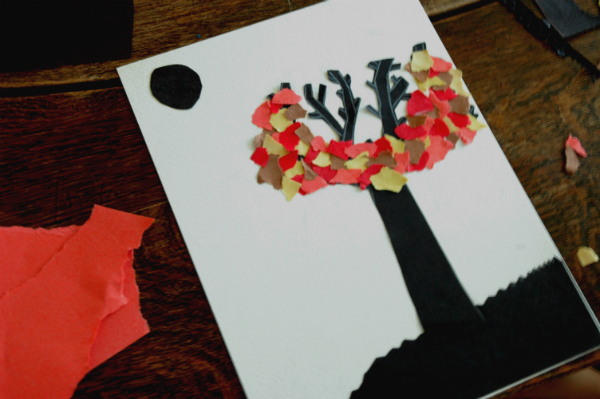 Step 8: Using black construction paper, cut out more fall/autumn shapes, like a moon, owl, bat, pumpkin, cat, or anything you like, and glue it to your scene. My 4-year-old did this project in 15 minutes. My 7-year-old took 25 minutes. Sometimes, after a long day of homeschool lessons, you have to take a break and do an art project. 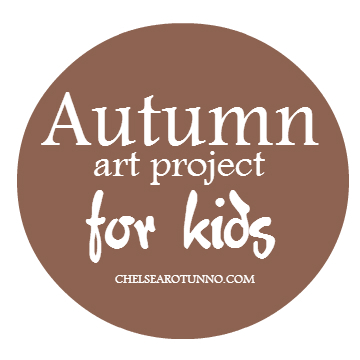 Maybe you will find this free autumn art project tutorial helpful if you are an elementary school teacher, a homeschool teacher, or if you just like to do crafts with your kids. Enjoy! This post is part of the 31 Days of Writing Challenge. I have taken the challenge to post every day in the month of October. Most will be on the topic of pregnancy, since I am in my last 31 days before my 5th baby is due (well, technically she is due Nov. 9, but that doesn’t mean much to me, since my 2nd baby was 24 days late. Thank you so much for joining me! As always, feel free to leave a comment on any of my posts. I would love to hear your side of the conversation. this looks fun! we should try it out. 🙂 i teach a 1st/2nd grage art class at our co-op. oops! typos! goes to show i shouldn’t comment while typing one-handed.